Everyone will love this comfort food classic with a fun new twist! Delight your diners with creamy Chicken Pot Pie Bundles, perfect for a winter night. Preheat the oven to 350°F. Heat 1 tablespoon of the oil in a large nonstick skillet over medium-high heat. Add the carrot and onion and cook, stirring frequently until softened (about 5 minutes). Add the garlic and cook 1 minute more. Stir in the chicken, tarragon, salt and pepper. Cook until the chicken is no longer pink, about 5 minutes. Place the broth and cornstarch in a bowl and whisk until well combined. Add to the skillet along with the peas and corn, and bring the liquid to a simmer, stirring constantly. Continue to simmer and stir gently until the sauce thickens, about 2 minutes. Place a generous ¼ cup of the chicken mixture into each wrap, and sprinkle Parmesan cheese on top. Fold the corners up and over the top of the filling, and press to seal the edges (it doesn’t have to be perfect!). Brush the remaining oil on top of each bundle. Calories: 360: Total Fat: 7g; Saturated Fat: 1g; Sodium: 680mg; Total Carbohydrate: 48g; Dietary Fiber: 3g; Protein: 24g; Vitamin A: 70%; Iron: 15%. Bissex, Janice. 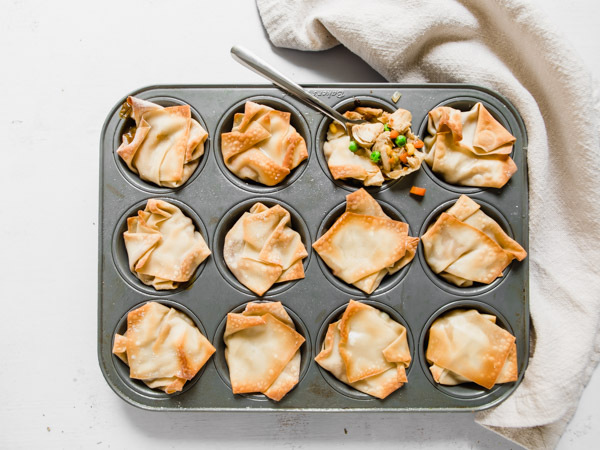 “Chicken Pot Pie Bundles Recipes.” Eat Right. Academy of Nutrition and Dietetics., 18 Mar. 2018, www.eatright.org/food/planning-and-prep/recipes/chicken-pot-pie-bundles-recipes.